New to the game? Never took the time to learn the game? Here ya' go! To win the game - One team must score more goals than the opposing team. 1. A goal is scored each time the puck goes past the goal line of the opposing team’s net. 2. A goal does not count if it is purposely kicked in by the foot, thrown in by the hand, or hit in by a high stick. 3. A goal accidentally deflected off of a player does count. 1. Six players from each team are allowed on the ice at one time. For each team this includes one goalie, two defenders, and three forwards. 2. There is a right defender and a left defender, although usually defenders may choose to rotate. 3. Among the forwards, there is a center, a right wing, and a left wing. 4. For a team playing in a league, there is usually a designated captain and assistant captain. These players are allowed to talk to the referees if any problems arise in the game. 1. A typical hockey rink has two blue lines defining the offensive and defensive zones for each team and a red line dividing the rink in half. 2. A team’s offensive zone is the area above the far blue line guarded by the opposing team. 3. A team’s defensive zone is the area below the near blue line guarded by its own team. 4. The zone between the two blue lines is called the neutral zone. 5. Circles on the left and right side of the goal nets define face-off dots for face-offs called in that zone. Centers line up in the centers of the circles, and wings usually line up on the sides of the circles. Defensemen usually line up in back of their wings outside of the circles. The defending team may reposition their forwards to better cover the offensive defensemen. 1. In a face-off, the center lines up against the opposing center. The centers take the face-off each time a puck is dropped by a referee in the game. They are the first to fight for the puck once it is dropped by a referee. Sometimes, either by a team's own decision or the referee's, another player may take a face-off instead of the center. 2. The right and left wings line up on the right and left sides of their center. They are lined up directly opposite the opposing team's wings. 3. The defenders line up in back of the forwards on the right and left sides. 4. The puck is dropped in the center ice at the start of the game. 5. Based on where a puck goes out of play, all other face-offs can occur anywhere on the ice. If the call is an icing or offsides, the play usually begins on the closest dot on either the right or left side. If the puck is flung outside of the rink, the play resumes at a place designated by the referee to be closest to where the puck went out of play. 1. When a player is completely across the blue line of his offensive side before the puck, the player is offsides, and the referee will stop the play if the player does not return to the blue line before returning to the offensive zone. 2. A new face-off is called right outside the offensive zone. 3. A player may straddle the blue line before going after the puck, after it passes the blue line. 4. A player may linger in his offensive zone even if the puck is not in the zone, but the player must make sure that when the puck enters the offensive zone, he is not offsides. The player must let the puck enter the offensive zone first before going after it. 1. If a puck that does not score is hit by a player before the red line and goes past the goal line of his offensive zone without being intercepted by a teammate or the opposing goalie, it is called an icing. 2. A new face-off is called in the defensive zone of the team that hit the puck. 1. A typical game is played in three periods, each twenty minutes long. Running time stops when the whistle is blown by the referee and starts when the puck is dropped into play. 2. Penalties, called by the referee, can be 2 minutes or longer, depending on if it is a major penalty, minor penalty, or misconduct. When a penalty is called, the referee will raise his hand. Time stops and the whistle is blown when a member of the team that committed the penalty touches the puck. The penalized player is sent to the penalty box. 3. Overtime may be called if the game is tied at the end. Other rules may call for a shoot-off if the game is tied at the end of the third period. 1. When a team has more players than the other on the ice, that team is said to be on the power play. This occurs when players on the opposing team have committed penalties. 2. The team with less players on the ice is said to be on a penalty kill. Icings are allowed for teams that are on a penalty kill. 1. While the puck is in play, offensive and defensive players may switch on and off the ice. Usually, once a player is within 5-10 feet of the bench, the other player can start getting on the ice. A penalty for having too many men on the ice may be called depending on the discretion of the referee. 2. Changes can also be made before each face-off. If an excessively long time has already elapsed, a referee may disallow any player changes to be made before that face-off. 3. Sometimes to boost the chance of scoring offensively, especially at the end of a game, the goalie may be called in to let another offensive player on the ice. Blue Line: Two lines running across the width of the rink, one on either side of the red line. The area between the blue lines is called the neutral zone. Boards: The walls around a hockey rink which are made of fiberglass measuring about 42 inches high and topped off by synthetic glass to protect the spectators while giving them a good view of the action. Body Check: A body check is where you use your body against an opponent who has possession of the puck. Legal body checking must be done only with the hips or shoulders and must be above the opponent's knees and below the neck. Unnecessarily rough body checking is penalized. Breakaway: A player in control of the puck has a breakaway when the only opponent between him and opposition's goal is the goalie. Catcher: The goalies glove which looks like a fancy baseball catcher's mitt, that goes on the non-stick hand. Center: In a traditional alignment with three forwards, the center plays between the left and right wings. Changing on the fly: When players from the bench substitute for players on the ice, while the clock is running. Charging: Taking more than three strides before deliberately checking an opponent. Clearing the Puck: When the puck is passed, knocked, or shot away from the front of the goal net or other areas. Crease: The semi-circular area in front of each goal is called the crease. If any offensive player is in the goal crease when a goal is scored, the goal is not allowed. The crease is painted blue on the ice. The goal crease is designed to protect the goalies from interference by attacking players. The area marked on the ice in front of the penalty timekeeper's seat is for the use of the referee. Cross Checking: Hitting an opponent with the shaft of the stick while both hands are on the stick and no part of the stick is on the ice. Defending Zone: When the other team is on the attack, the defending zone is the area between your goal line and your blue line. Defensemen: Two defensemen usually try to stop the opponent's play at their own blue line. The defensemen block shots and also clear the puck from in front of their goal. Offensively, defensemen take the puck up the ice or pass the puck ahead to the forwards; they then follow the play into the attacking zone and help keep it there. Delay of game: This is called when a player purposely delays the game. Delay of game is commonly called when a goalies shoots the puck into the stands with the puck deflecting off a skater or the glass. Delay of game also occurs when a player intentionally knocks a goalpost out of its stand (usually in an attempt to prevent a goal from being scored). Delayed off-side: In this situation, an attacking player has preceded the puck into the offensive zone (normally a case for off-side), but the defending team has gained possession of the puck and can bring it out of their defensive zone without any delay or contact with an opposing player. Diamond: A defensive alignment often used by a team defending against a power play. Dig: An attempt to gain possession of the puck in the corners of the rink. Directing the Puck: Changing the course of the puck in a desired direction by using the body, skate, or stick. Dive: When a player exaggerates being hooked or tripped in an attempt to draw a penalty. Elbowing: Using the elbow to impede or disrupt the opponent. Empty Net Goal: A goal scored against an opponent that has pulled the goalie from the crease to add an extra attacker. Face-off: The action of an official dropping the puck between the sticks of two opposing players to start play. Fisticuffs: When a player throws a punch (closed fist) and makes contact with an opponent. Five-hole: The area in the opening between a goalie's leg pads. Flat pass: A pass where the puck remains on the surface of the ice. Flex: Hockey sticks come in different degrees of flex - medium, stiff, and extra stiff. A stronger player, who hits more powerful shots, usually wants a stiffer stick. Flip Pass: A pass where the puck is lifted so that it goes over an opponent or his stick. Forecheck: Forwards forecheck by hurrying into the opponent's defensive zone to either keep the puck there or take it away. Forward: The center and wings are traditionally considered to be the forwards. Freezing the puck: A player freezes the puck by holding it against the boards with the stick or skates. A goalie freezes the puck (when the opposition is threatening to score) by either holding the puck in the glove or trapping it on the ice. Note:: A delay of game penalty can be called if the goalie freezes the puck when the opposition is not threatening. "G": An abbreviation for "goals"
Game suspension : When a player, coach, or manager receives a game suspension, that person can't participate in the next scheduled game. Goal: A goal is achieved when the entire puck crosses the goal line and enters the net. You can't deliberately kick it in or bat at it with a glove, although a goal is counted when a puck deflects off a player (but not off an official). A goal is worth one point. Goal Judge: A goal judge sits behind each goal (off-ice) and signals when the puck has crossed the red goal line by turning on a red light above his station. The referee can ask the goal judge's advice on disputed goals, but the referee has final authority and can overrule the goal judge. Goaltender: The goaltender's main job is to keep the puck from entering the goal net. The goaltender is also known as the goalie, the goal keeper, or the netminder. "GP": An abbreviation for "games played"
Hat trick: A player who scores three goals in one game achieves a "hat trick". area; or using the head to strike an opponent. Heel of the stick: The point where the shaft of the stick and the bottom of the blade meet. High-sticking: Carrying the stick above the shoulder to use against the opponent. Holding: Using your hands on an opponent or the opponent's equipment to impede your opponent's progress. Hooking: Applying the blade of the stick to any part of an opponent's body or stick and pulling or tugging with the stick in order to disrupt that opponent. Icing: An infraction called when a player shoots the puck from his side of the red line across the opponent's goal line. Play is stopped when an opponent (other than the goalie) touches the puck. The face-off is held in the offending team's end of the ice. A team that is short-handed can ice the puck without being penalized. Injury potential penalties: Injury potential penalties include checking from behind, head butting, spearing, boarding, charging, cross checking, elbowing, kneeing, high-sticking, hold the face mask, slashing and roughing. 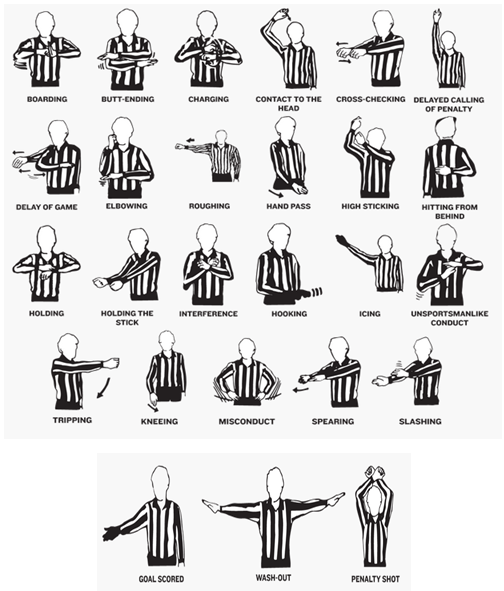 A linesman may report these infractions occurring behind the play to the referee (following the next stoppage of play) if the referee did not see them. Interference: Making body contact with an opponent who does not have possession of the puck. Interference is also called when a player is standing in the crease or otherwise making contact with the goaltender. Kneeing: Using the knee in an effort to impede or foul an opponent. Linesman: Two linesmen are used to call offside, offside passes, icing and handle all face-offs not occurring at center ice. Although they don't call penalties, they can recommend to the referee that a penalty be called. 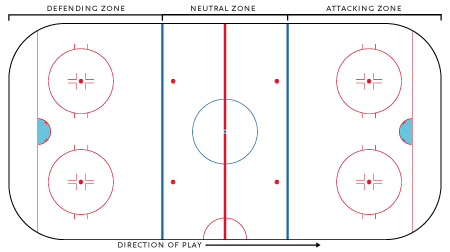 Neutral zone: The central ice area between the two blue lines (neither defending nor the attacking zone). Obstruction Penalty: An obstruction penalty will be assessed for holding, holding the opponent's stick, hooking, interference and tripping infractions which occur away from the puck carrier. The penalty will be announced as, "two minutes for obstruction holding." Off-ice (minor) official: These officials include the official scorer, game timekeeper, penalty timekeeper, and the two goal judges. The referee has full control of all game officials and final decision. Offside: A team is offside when a player crosses the attacking blue line before the puck does. A face-off then takes place just outside that blue line (in the offending player's defensive zone). The determining factor in most offside situations is the position of the skates Both skates must be completely over the blue line ahead of the puck for the play to be offside. Offside pass: An offside pass (also known as a "two-line pass) occurs when a member of the attacking team passes the puck from behind his own defending blue line to a teammate across the center red line. If the puck precedes the player across the red line, the pass is legal. Also, an attacking player may pass the puck over the center red line and the attacking blue line to a teammate if the puck precedes that teammate across the blue line. The face-off after an offside pass takes place at the spot where the pass originated. One-timer: Shooting the puck immediately upon receiving it without stopping it first. A one-timer is an effective way to beat the goalie before he can slide from one side of the crease to another. Penalty: A penalty is the result of an infraction of the rules by a player of team official. A penalty usually results in the removal of the offending player (or team official) for a specified period of time. In some cases, the penalty maybe the awarding of a penalty shot on goal or the actual awarding of a goal. Penalty killing: When a team is shorthanded and attempts to prevent the opposition from scoring, this activity is known as "penalty killing. Penalty-killing unit: The group of players brought in by a shorthanded team in order to defend against a power play. Penalty shot: A penalty shot is awarded to an offensive player who - on a breakaway- is illegally checked or impeded. The puck is placed at the center face-off spot, and the player has a free try at the opposing goal with no other defenders on the ice besides the goalie. "PIM": An abbreviation for "penalties in minutes" (penalty minutes accumulated). Point: The point is the area just inside the opposition's blue line close to the boards on either side of the rink. 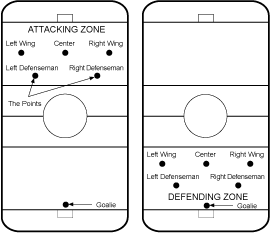 A defenseman usually occupies the area when his team is in control of the puck in the opposition's defensive zone. Possession of the puck: The last player or goalie to make contact with the puck is the one who has possession. This definition includes a puck that is deflected off a player or any part of his equipment. Power play: When a team has more players on the ice than the opposition due to one or more penalties against the opposing team. "Pts. ": An abbreviation for "total points". Pulling of a goalie: A team that is losing will sometimes take their own goalie off the ice and use another forward. This situation occurs most frequently near the end of the game when a team is behind and needs some emergency offense. Red line: The line that divides the rink into two equal parts. This area is center ice. Referee: The referee supervises the game, calls the penalties, determines if goals are scored, and handles face-off's at center ice at the start of each period and after goals. The referees has the final decision over all of the officials. Roughing: Engaging in fisticuffs (fighting) or shoving. Save: A shot blocked by the goalie - a shot that otherwise would have gone into the net! Shadow: When a player covers an opponent one-on-one everywhere on the ice in order to limit the effectiveness of this opponent. Shorthanded: A shorthanded team is below the numerical strength of it's opponents on the ice. When a goal is scored against a shorthanded team, the penalty that caused the team scored against to be shorthanded is terminated, and both teams are again at equal strength. Slap shot: A slap shot occurs when the player swings the stick back and then quickly forward, slapping the puck ahead with a forehand shot. Slashing: When a player swings the stick at an opponent. Slashing merits a penalty, whether contact is made or not. Tapping an opponent's stick is not slashing. Slot: The prime scoring area up the middle of the ice, between the face-off circles. When you "clear the slot", you shove an opposing player out of the area in front of your goal. Smothering the puck: When a goalie or other players fall on the puck. Smothering is legal when done by the goalie or accidentally by another player. Sniper: A player who is a pure goal scorer and who doesn't hit other players or the boards all that much. Spearing: Poking or attempting to poke an opponent with the tip of the blade of the stick while holding the stick with one or both hands. Splitting the defense: When a player in possession of the puck goes between two opposing defender while attacking. Stick checking: Using the stick or its blade to poke or strike an opponent's stick or puck in an attempt get possession of the puck. Stickhandling: A term for carrying the puck along the ice with the stick. Sweater: A term used to designate a hockey jersey. Sweep check: Using the entire length of the stick with a sweeping motion along the surface of the ice in order to dislodge the puck from an opponent. A team that is shorthanded on a power play often employs a sweep check. Team official: A person responsible for the operation of a team, such as a coach, manager or trainer. Trap: Traps are defensive formations designed to minimize the opposition's scoring opportunities and keep it's offense from functioning. The idea is to trap the puck in the neutral zone, halting the opponents and regaining control of the puck. Tripping: Using a stick, arm, or leg to cause an opponent to trip or fall. Turnover: Just as in basketball or football, you can make a turnover in hockey by losing control of the puck to the opposing team. Two-line pass: An offside pass (that actually crosses two lines). Wings: The left wing and the right wing (also known as forwards) move up and down the sides of the rink. Offensively, they skate on each side of the center, exchanging passes with him, while trying themselves for a shot on goal and/or a rebound of a shot from the point. Defensively, they watch the opponent's wings. Wrist shot: A wrist shot is used to shoot the puck off the blade of the stick with a flicking motion of the wrist. Zamboni: The vehicle used to prepare the rink's ice surface before the game, and after each period. The Zamboni scrapes a thin layer off the ice, heats the ice, and puts down a fresh layer of heated water that freezes to form a new layer of ice.